The masters of puppets are the masters of humans. To bring life to a puppet one must capture the human soul. Puppet Master Sakon (Karakuri Zoushi Ayatsuri Sakon) is a two course supernatural-tinged mystery series. 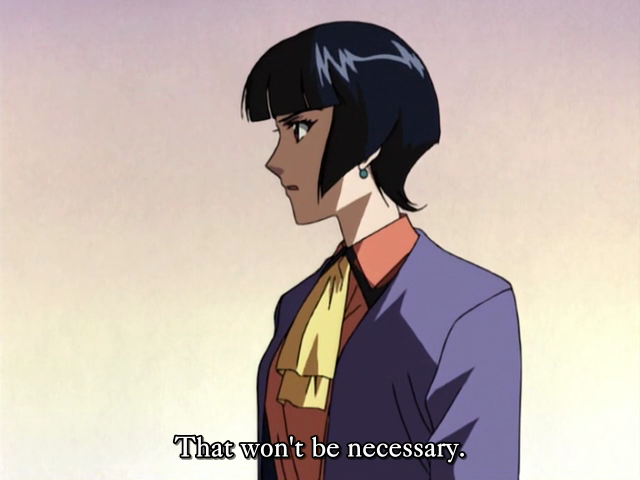 The show rests upon two primary conceits: the connection between spiritualism and certain traditional Japanese arts, and the familiar mystery trope of the amateur detective who has a tendency to stumble across murders. This is a spoiler-free review, so if you are interested in mystery series, puppetry (Bunraku), or older anime, please read on. 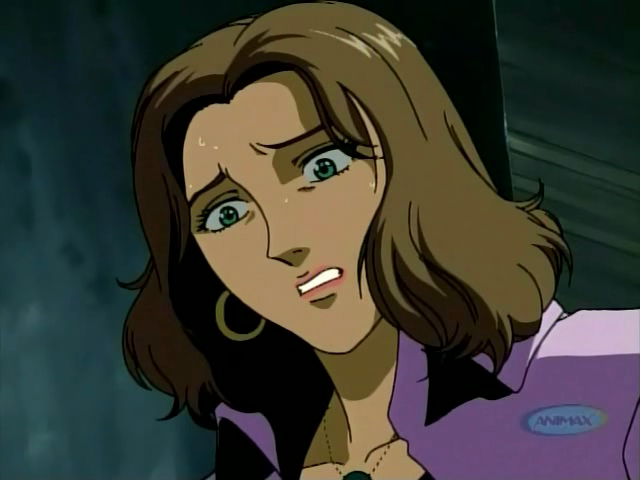 Kaoru-neesan, AKA Detective Kaoruko Tachibana, Sakon's aunt. Kaoru-neesan doesn't always get along with Ukon. 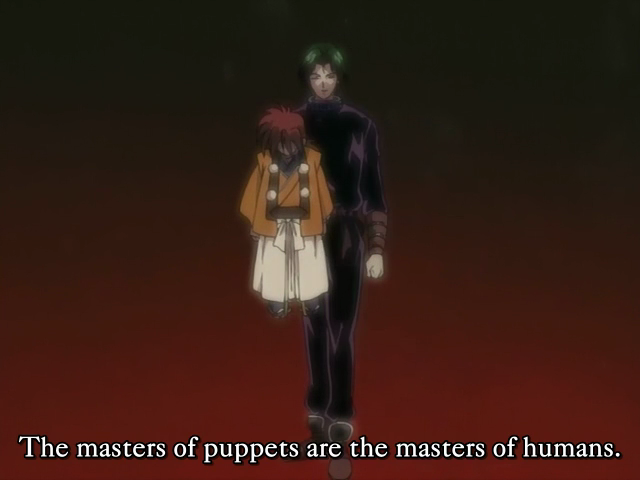 The first thing to note about Puppet Master Sakon is that it is one of the last anime of the Twentieth Century. It premiered in the Fall 1999 season. As such, it looks a little old compared to current anime. Colors aren’t quite as bright as is common these days. Character designs are simpler (and have noses!). Also the show includes a lot more adult characters than are typically seen in anime these days. I suppose that there are some who might be put off by the ’90s art style, but I found the change from current conventions refreshing. 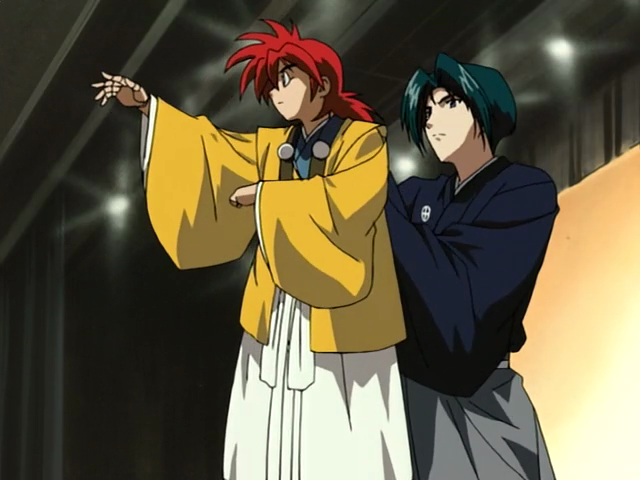 Ukon (left) and his master, Sakon (right), perform. Ukon is the more talkative of the two. One great thing about being an older show is that the cast includes some excellent seiyuu. Chief amongst these are those playing the main duo. 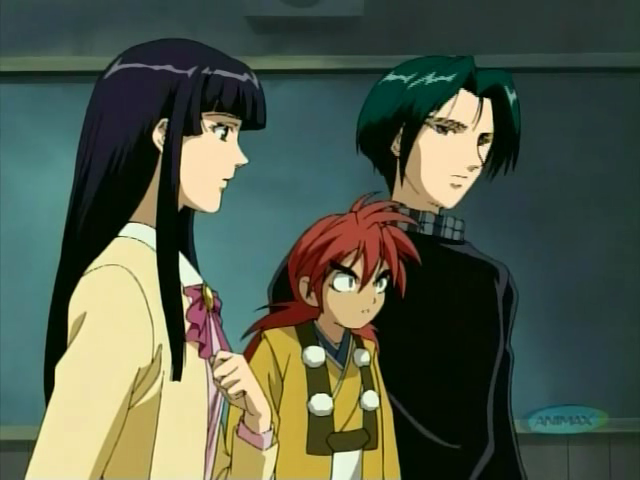 Sakon is played by Megumi Ogata, whose most famous role is probably Shinji in Neon Genesis Evangelion. Sakon’s side-kick is a puppet, named Ukon, that was made by a famous craftsman in 1870. While Sakon is very intelligent, he is quite reserved, so he relies on his little friend, who is loud, flirtatious, even rude at times, to do most of the talking. 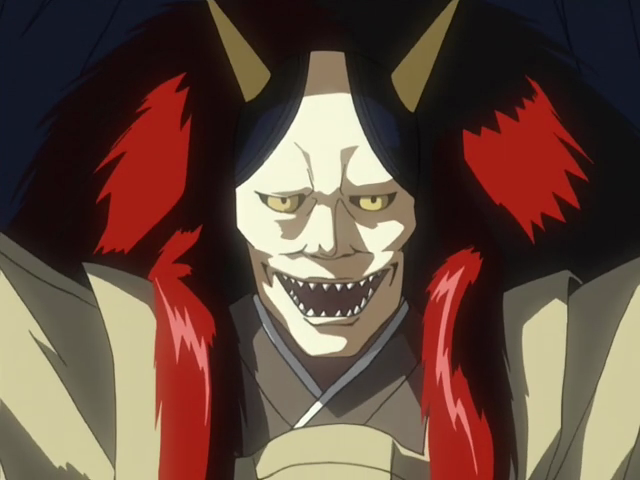 Ukon is played by Motoko Kumai, who played Syaoran Li in Cardcaptor Sakura, and is perfect for this role. Each mystery typically has a supernatural element to it — almost always associated with some traditional Japanese art: Noh drama, Bunraku (puppet theater), Sword crafting, sculpture. In addition to offering interesting, somewhat creepy, settings for the murder mysteries, they also provide interesting insight into the society of those who seek to perpetuate traditional Japanese arts. I really enjoyed this aspect of the show. I certainly would encourage those with an interest in such arts to check the show out. Though the depictions of these communities are not extremely detailed, it is an unusual opportunity to view what things might be like within a Noh troupe, or in a Bunraku puppet craftsman’s workshop. The core of the show is a classic murder mystery series. Most mysteries are presented in arcs of three episodes. These are traditional whodunit-style mysteries, and several are presented as locked-room mysteries. These mysteries are generally pretty interesting. Three episodes is a good length to toy with the viewer. Typically the initial expectations set up with the first episode turn out to be misdirection, and are overturned in the second episode. I would encourage fans of mystery series to give Puppet Master Sakon a try. Because of their likeness to humans, dolls can be pretty scary at times. I recommend checking Puppet Master Sakon out. You never know what you might find! In summation, I enjoyed this series. The artwork is a bit dated, but the darker color palette fits the mood of a supernatural mystery, and the older characters, whose design doesn’t depend upon the recent trend towards moe was quite refreshing. The main characters, Sakon and Ukon, are a great pair of amateur sleuths, who tackled challenging mysteries. Further the mix of traditional arts and supernatural elements was engaging. I remember watching this on WOWOW and it was such a fascinating series and the mood was always consistent. 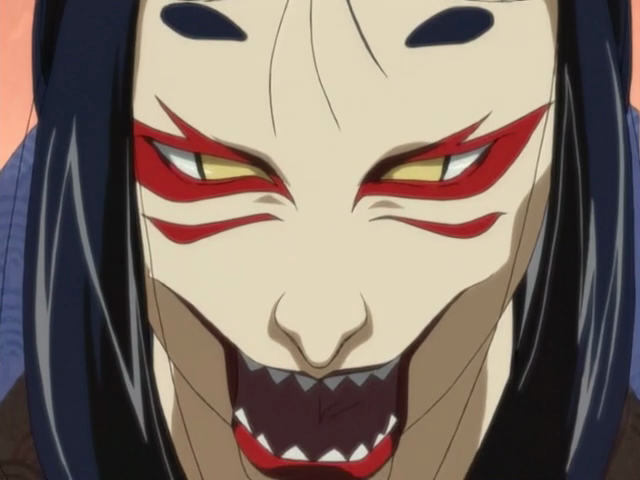 Sakon and Ukon were quite the duo and the crimes were pretty creative! A very interesting series! 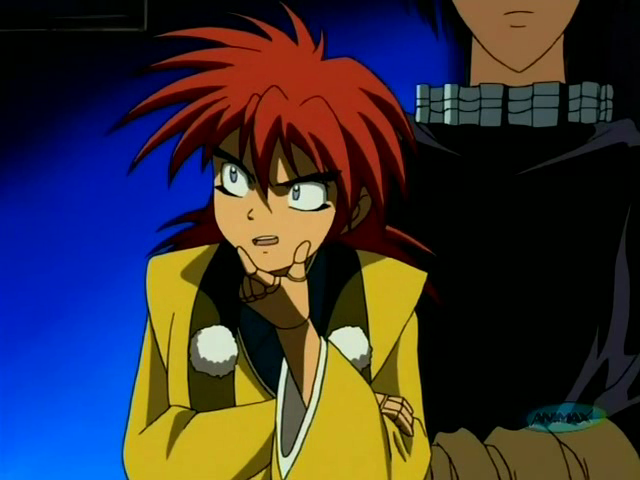 It was pretty fun watching Ukon get out of hand, then Sakon would have to tell him to tone it down. I’m not much of a manga reader, so I really haven’t seen Obata’s work first hand, but I have to say he has worked on some cool projects. I wonder if Mashiro (from Bakuman) is based on him in part.